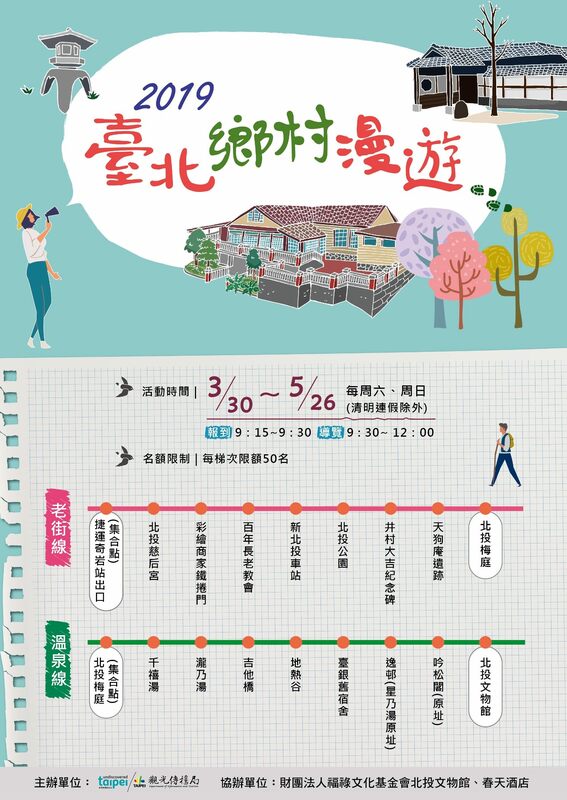 After the successful Beitou Slow Travel Festival which premiered last year, the Taipei City Government’s Department of Information and Tourism (TPEDOIT) has decided to expand the event into the 2019 Taipei Slow Travel Festival to introduce Beitou’s scenery and hot springs, old streets and history, food and culture to those that love Slow Travel. TPEDOIT Commissioner Liu Yi-ting said that the festival serves slow travelers with two distinct and attractive packages. The first package, Slow Tour Along Beitou’s Hot Springs, is partially sponsored by the Fulu Culture Foundation and includes an admission-free visit to the Beitou Museum and free entry tickets to several hot springs around the area. The second package, Slow Tour Along Beitou’s Old Streets, is a continuation of last year’s tour and takes visitors along Beitou’s century-old Cihou Temple, Guangming Street known for its graffiti art, century-old Beitou Park, and Plum Garden, and stops for a taste of Beitou delicacies such as rice noodle soup and prosperity porridge. A total of 16 tours will be organized under this event, and registration beforehand is necessary. The first block of the four tours became available for registration on March 25 at 09:00 and was sold out within 30 minutes. Those who missed the boat will have another chance on April 8, 09:00, when registration for the second block of four tours opens for signup. In May, other events will be held as well as part of the 2019 Taipei Slow Travel Festival. For further information, please visit the Taipei Travel website at https://www.travel.taipei/zh-tw/news/details/19549, which offers a wealth of information on leisure and nostalgia in Beitou District. * Registration for the second block of four Slow Tours Around Beitou The second block consists of four tours on four different days, with 50 participants each. Online registration: April 8, 09:00. Please follow the Taipei Travel website for the latest news. Festival information hotline: (02) 2896-5518 (Monday to Friday 10:00-18:00).